Our entire life, everything that surrounds us, and ourselves, all belong to a certain place, which with our rational minds, we call “this world.” But the upper system, the Creator, exists above our level and influences us so that we, with our own strength, with the help of our requests and prayers, understand our state and desire to rise above it. If I receive some type of disturbance in my present-day reality, within my reason, then I understand that it comes from the Creator who is awakening me through this, helping me to raise to His level. 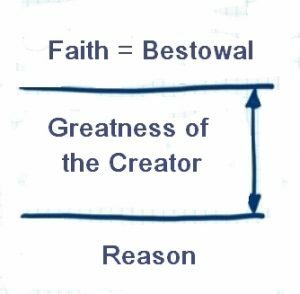 That is why I ask for the greatness of the Creator, in order to rise to the level of faith, to bestowal above the revealed problem. The question lies in why do I rise: simply to feel better? Then it is a Klipa, because I want to use the force of the Creator for my personal well-being. It turns out that the Creator is not important to me, faith is not important to me, but only that I feel good in my desires. It is the same with religions and other beliefs. But maybe I am ready to remain with the unpleasant sensation in my desire to receive and above it build a desire to bestow, and that is why I ask to be raised to the level of faith. It turns out that I have two levels and I try to save them both, rejecting neither. The difference between them can then grow to such an extent that the Creator is revealed in it: between Bina and Malchut.